It illustrates very clearly how the control flow from the user to the interface adapter and back to the user works in the Clean Architecture. It also shows how code dependencies should be organized. I have then shown you some F# code which basically implemented this picture. 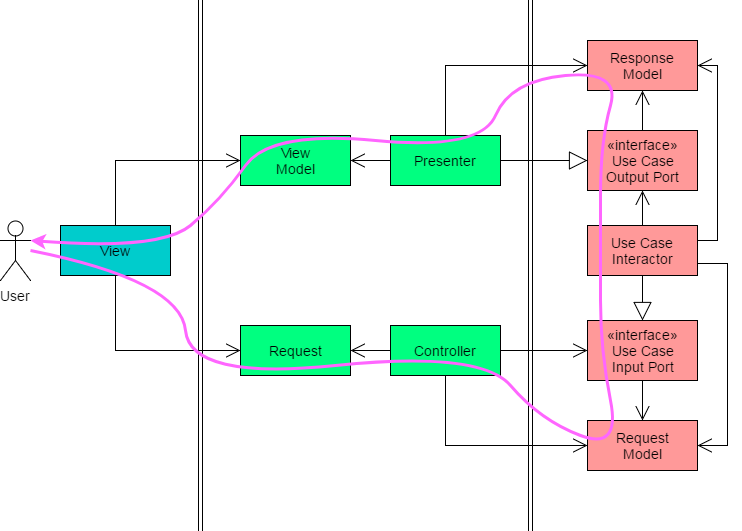 In the end of the post I had request and response objects, request and response models, a controller and a presenter. Note: In this picture the BacklogPresenter is part of the BacklogController as it is still kind of “private” class controlled by the BacklogController. This picture clearly shows that on the one hand the control flow and the dependencies between my classes from Athena project are pretty much conform with the Clean Architecture and the Dependency Rule. On the other hand the color coding makes it obvious that the dependency between my classes and the Asp.Net classes breaks the Dependency Rule. Choosing this option means that I would continue implementing my Clean Architecture controllers as derived classes from Asp.Net Controller and that I would continue using Asp.Net view model classes like SelectListItem. I would continue ensuring that the control flow and the dependencies between my own classes matches Clean Architecture and Dependency Rule. And of course I would have to accept this (small) violation of the Dependency Rule. This approach is a rather simple, pragmatic and convenient one. All the data conversion logic remains in the “interface adapters” layer and I could continue using the benefits of Asp.Net framework. But of course there are drawbacks. The more I use the convenience of the Asp.Net framework the more my code of course depends on the framework. If I would ever want to migrate to another framework - like Asp.Net Core or Suave.IO or NancyFx - this would have quite some impact on my controller and presenter implementations. Another aspect would be testing. Today I don’t do much testing on controller and presenter layer. As all my business logic is in the interactors I have focused most of my testing efforts on these interactors. Even if my controllers and presenters do data conversion only there could be bugs and certainly testing this “logic” as well would be beneficial. But testing can become rather difficult if the controller utilizes many APIs from Asp.Net base class (e.g. Request and Session property). How do I fake all these APIs correctly? There is another observation I have made in my code base: my presenter logic tends to spread across multiple “helper” classes. As the Razor engine supports executing C# code from the HTML templates it is quite convenient to add custom types to view models and have some rendering functions which extract the relevant information and convert it into strings. This convenience made the view far less “dumb” than it should be (Is the view calling the right function? Has the view model property the correct type to be passed to a function?). 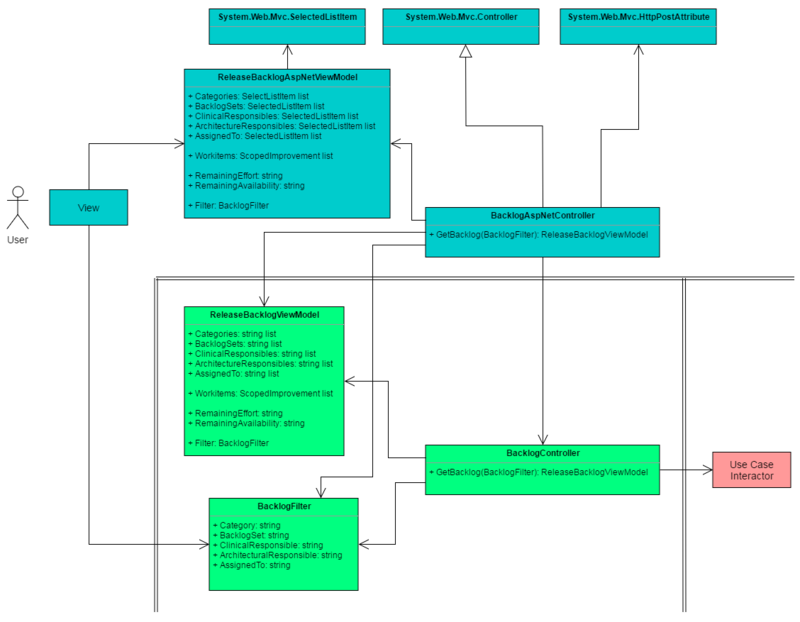 The simplest solution towards a design which is conform with the Dependency Rule would be to move the BacklogController and the ReleaseBacklogViewModel from the “interface adapters” layer into the “frameworks” layer. This would mean that all the data conversion logic goes into the “frameworks” layer and the “interface adapters” layer becomes rather empty. I would probably add a new layer of assemblies, e.g. 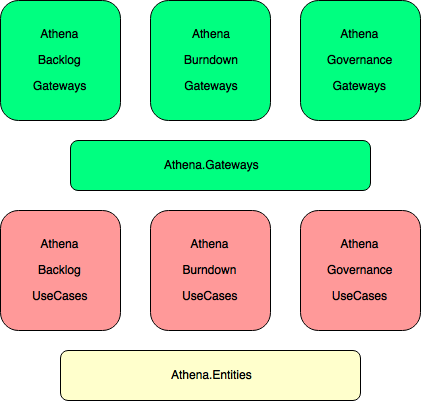 : Athena.Backlog.AspNet.dll to make the design decision explicit in the code. This approach is also simple, pragmatic and convenient. But having so much “application logic” in the “frameworks” layer makes the code base more ugly from my perspective. And of course the other problems mentioned above about testing and complexity are not solved either. The BacklogController would still contain most of the data conversion logic between view and use case interactor. The BacklogAspNetController would be a very thin adapter between the Asp.Net framework and my application controller converting between Asp.Net types and custom types. The ReleaseBacklogViewModel would not reference any Asp.Net types any longer but only primitive and custom types. The BacklogAspNetController would then convert the ReleaseBacklogViewModel into a ReleaseBacklogAspNetViewModel in case I would want to continue using the Asp.Net rendering helper functions in the Razor templates. In turn, if I would stop using these functions the ReleaseBacklogAspNetViewModel would not be needed. Note: There is still a small design flaw in the refactored design. 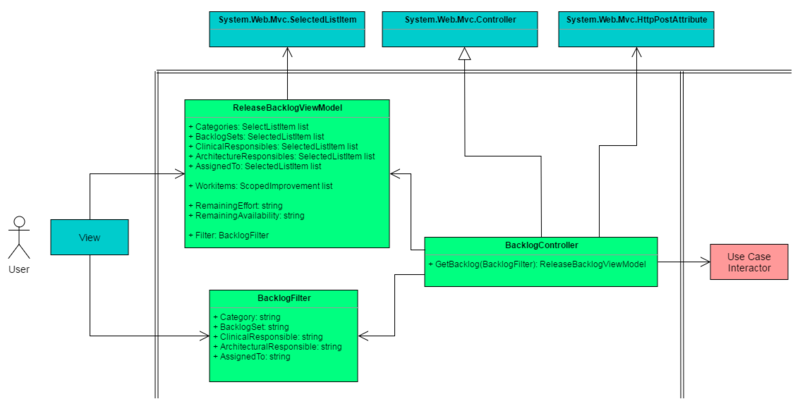 The ReleaseBacklogViewModel returns ScopedImprovement which is a class defined in the use case layer. Reusing this class in the presenter - something which Uncle Bob considers as cheating - looks very convenient initially. The consequence of this design that I need some logic in the view to do the job of the presenter and “render” the properties of ScopedImprovement which makes the view smart again. But, in Clean Architecture, we want the view to be as dumb as possible so that there is no logic left which needs to be tested. Of course the Asp.Net MVC framework didn’t force me to choose this design but such frameworks provide some very convenient “magic” to get things done “fast” which in the longer run can slow you down. That’s why frameworks should be used with care. I will later fix my design by simply using the helpers in the presenter directly instead of from the views, make the view model properties “stings only” and so the view dumb again. The BacklogPresenter is still injected into the use case interactor. This is now done in the BacklogAspNetController. The BacklogInteractor is then injected into the BacklogController. Note: In F# we use partial function application as a kind of dependency injection. With this approach the application controller does not know any thing about the presenter and so get’s even closer to the Clean Architecture. The BacklogAspNetController does not only bridge between Asp.Net framework and application, it also takes care of wiring controller, presenter and interactor. Actually this should be the responsibility of the MAIN module but this is a topic for an own post. I have considered this as a good compromise between the need for borders in the architecture and pragmatism. Now with the new insights on separating application controllers and Asp.Net framework, does the picture change? Previously I haven’t created projects in the “frameworks” layer as I haven’t seen much code which would go there. The simplest approach to incorporate the new insight would be to add a new project in the frameworks layer per business aspect. This would result in quite some projects. Can we simplify this? 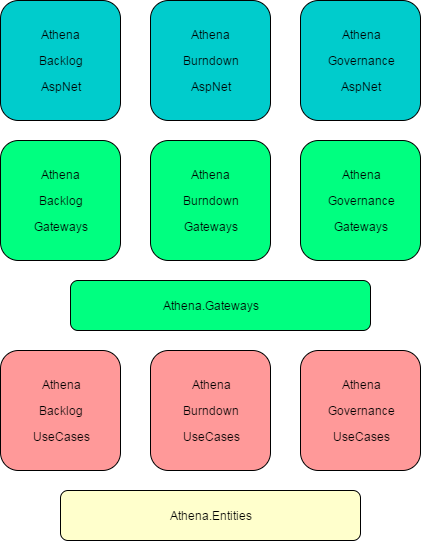 This approach clearly draws the two most important boarders between frameworks and application and between application specific logic and enterprise business rules (entities). Now that we have discussed multiple options with pros and cons - what would be the best option? As usual when talking about architecture and design there is only one correct answer: It depends. It depends on the concrete project. It depends on the size of the project. Borders are more important in a project with 500 developers than in a project with one developer. It depends on the future plans of the project. Portability to new frameworks is not equally important for all project. It depends on the skills of your teams. More experienced developers see borders in the code even if they are not enforced with separate projects.